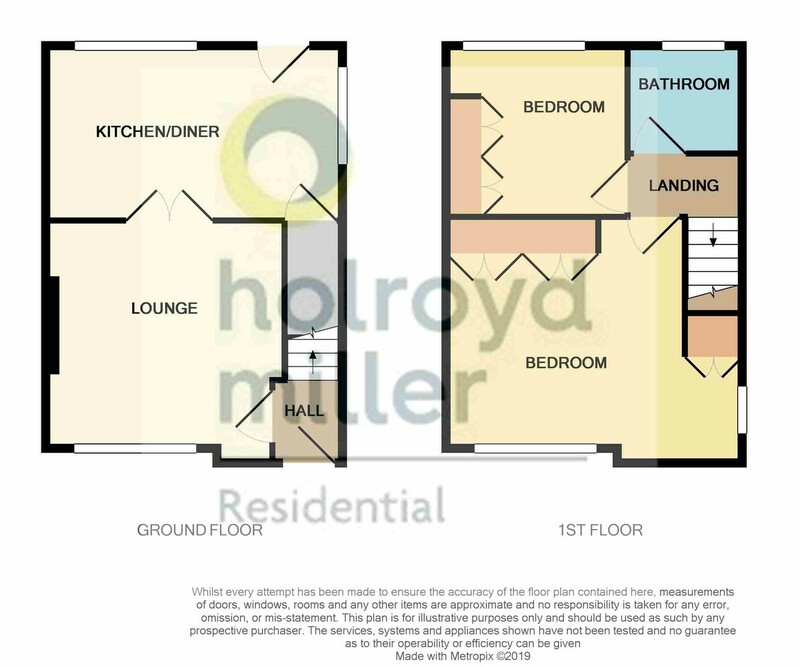 Holroyd Miller have pleasure in offering for sale this well presented two double bedroomed semi detached house occupying an enviable cul de sac position on the edge of Stanley village with open aspect to both front and rear. ENTRANCE HALL With double glazed entrance door, staircase to first floor, central heating radiator. DINING KITCHEN 16' 0" x 9' 4" (4.89m x 2.87m) Well appointed with a range of cream shaker style fronted wall and base units, timber effect contrasting worktops, stainless steel sink unit, single drainer with mixer tap unit, fitted double oven, hob with extractor hood over, plumbing for automatic washing machine, tiling between the work tops and wall units, feature radiator, two double glazed large window and rear entrance door, useful under stairs storage cupboard containing combination central heating boiler. BEDROOM TO FRONT 15' 8" x 11' 6" (4.78m x 3.52m) Having dual aspect double glazed window making the most of the open aspect, built in storage cupboard over the staircase, fitted wardrobe, central heating radiator. BEDROOM TO REAR 9' 7" x 9' 4" (2.94m x 2.87m) A good sized second bedroom with fitted wardrobes, access to useful loft space, double glazed window, central heating radiator. COMBINED BATHROOM Furnished with modern white suite comprising of; wash hand basin, low flush w/c set in back to wall furniture, panelled bath with Triton electric shower over with shower screen, tiling to the walls. OUTSIDE The property occupies a pleasant cul de sac position with driveway providing ample off street parking with double opening gates providing security and further access to the driveway to the side, sectional concrete single car garage with up and over door. A pleasant garden area to the front with rockery, to the rear, paved patio with further lawned garden with flowering borders and rockeries.